Another article by Steve Wheeler that raises an important issue. Really? Who would have thought it? Why the attempt to make reading simple? A reply to Learning to Read: Should We Keep Things Simple? Powerful article by Ken Goodman – a must read. This article by Donald Clark is well worth reading! “Why Use the Inquiry Cycle? Bruce’s comment: Many teachers use the Edutopia(with its focus on project based learning) devised by Star Wars director George Lucas. Edudemic is another rich resource for schools integrating technology into their classrooms. Edutopia’s focus is on project based learning. Bruce’s comment: Read about Edutopia’s brilliant vision. Bruce’s comment: A school district in California rediscover the value of field trips – will wonders never cease!!!! In this article Bruce reviews this book and shows how it could be implemented in the classroom. Not to be outdone by Kelvin, here’s an article Bruce wrote back in 2009, that also casts a skeptical eye over John Hattie. What is this thing called learning? What is this thing called learning. It seems simple enough. So why do so many ‘learners’ fail at school? Dysfunctional schools or dysfunctional learners? “If children are always asking questions then ought not our classrooms help them in their search for answers? Maybe it’s time to reflect on what is fundamental in education. An article targeted at high schools, but there’s plenty to stimulate thinking at primary schools. Does tinkering lead to learning? Annie Murphy Paul’s observations on the maker movement – well worth reading. Just in case you haven’t read enough about Finland’s education system, here’s another viewpoint. This is a technical article, well worth reading. ‘The current standardised approach’, writes Hood, ‘needs to be replaced by one that focusses on the individual. Personalised learning is about creating a learning environment that responds to the needs of each individual student and their interests, talents and passions and aspirations’. ‘In an environment where there is clear vision, shared values, high expectation and a culture of challenging traditional ways of doing things, then people will work in a myriad of unplanned , unseen and successful ways; it will be a creative and innovative environment’. Bruce’s comment: What is your class’s image of a scientist? Once you have identified their prior image (stereotype) see if you can modify, or reconstruct, it. A fun activity with some serious learning implications. Consider trying ‘prior drawings’ of students ideas about whatever you are studying, for example what are their prior images of spiders- after learning experiences do another drawing to see if they have changed their minds! A great assessment task. Bruce’s comment: Avoid ‘blurry’ visions and ‘shiny objects’. A short but pertinent article that applies to any school. This article by Bruce explores a similar theme to the one above. Pavlov’s Dogs – an untold story. Bruce’s comment: A new twist on Pavlov’s dogs! Artistry versus conformity in teaching. Teacher artistry or deliverer of approved ‘best practices’? Australia – A testucator’s Paradise. Since its first introduction to British ways of doing things, Australian schooling has been based on the notion that children attend school to learn how to read, write and calculate; nothing much more. Any other reasons for attending school have been deemed as unimportant and can be done without. That was the purpose of the early governors when they approved of and established schools ….so that the raw communication and trading exchange skills of soldiers’ children, convict and former-convict children could be used more efficiently by the traders. The cashed-up squatters and merchants’ own children needed something more in line with the noble folk in mother England. Now, our maintenance of a class structure remains more British than the British. Grammar Schools offered the model for those who could afford them, and religions wanted to make sure that their children did not lose their faith and could ‘keep up with the Joneses’ at the same time. So, modelled on British Grammar school styles of operating, Australian schooling became a pretty strict class system, based on fear of the birch and of failure. Tests had to be conducted at certain points to see how teachers and pupils were going. Those who were not coping, were ‘left down’ to a lower level or encouraged to depart from schooling. Mindless plutocratic neo-hoods described this as ‘tough love’. It was certainly tough. From Year One, children started to prepare for the HSC and other school graduation devices, invented by states. One didn’t need any variety of teacher competencies to ‘teach/instruct’ in such schools at the time. All children were treated as students who did as they were told. Direct instruction was the only kind. Post-WW2 educators, strangely enough prompted by war experiences, started to view learning per se from a different perspective. They had found , through catch-as-catch-can modes of organising schooling that children really liked to learn in bomb shelters and the like, with only bricks and mortar for teaching aids. Teachers started to observe HOW children learn and to make the most of this learning desire by establishing caring, happy learning climates within and outside peculiar classrooms that, as raw as the buildings were, became centres of serious learning. They had found, especially in these bomb-ravaged parts of England that children were naturally curious and interested in the world around them, that they wanted to share, to handle things, to explore and to try new things. They learned by doing, observing, imitating and teaching others, with a wide mix of ages all helping each other. For them, learning was an active, individual occupation. No two pupils were the same in teaching/learning requirements. Teachers came to realise that “where the affective domain is secure, the cognitive is inevitable.” [John Settledge] and that children are as thrilled and motivated by achievement as much as they feel disappointed and rejected by failure. They don’t need to be presented with situations [like NAPLAN] that makes them fear any kind of learning enterprise. Achievement had no bounds. Australia totally ignores Maslow’s Hierarchy of needs. Human indignities are piled on young children during NAPLAN time with the full knowledge that self-actualization, self-motivation and high achievement can never by reached under such circumstances. Trevor Cobbold’s recent mega research has clearly demonstrated that NAPLAN is plainly useless for what it thought it might do. Schools and school designs altered; and Australia, by copying what was learned, became known throughout the world, in the 50-80s period, for the kind of products that emerged from the school system ….thinkers, innovators, amazing scientists and mathematicians, first class entrepreneurs and business leaders who have made enormous contributions to world welfare and advancement. You will know of at least one of these giant Aussie graduates of the period . It is unlikely that we shall ever see their like again…… while NAPLAN is around. The notions of the Harvard-prone managerialists imbued with peculiar contrary-business models stuffed up everything big-time, starting about 1990. It set the platform for kleinism, the fear-based NAPLAN system’s essential element. As a consequence, the political control of classrooms brought forth a strain of thinking-resistant humans who inhabited positions of importance in schools and boards and authorities, all of whom seemed anxious to deprive the world of ethics, integrity and the yen to think. Scientists at the University of Minnesota http://www.newyorker.com/human/borowitz-report have identified the strain within their own profession, especially as it applies to climate-change. “These humans appear to have all the faculties to receive and process information, and yet, somehow, they have developed defences that, for all intent and purposes, have rendered those faculties totally inactive.” More worryingly, as Davis Logsdon, one the the scientists, points out :”As facts have multiplied, their defences against those facts have only grown and multiplied.” Refer to Cobbold’s indisputable data. Learning receptors –eyes, ears, and mouth – have connections to the brain which are unused by the testucating fraternity at NAPLAN time. It could be added that, where all connections from receptors to the brain do exist, but are switched off by fiat or voluntarily, then eichmannism develops. While he and other Minnesota scientists confess that they do not have a clear understanding of the mechanisms that prevent the fact-resistant humans from absorbing data …..[ the NAPLAN supporters and engineers in our case]…they theorise that the strain may have developed the ability to intercept and discard information en route from the auditory nerve to the brain. “The normal functions of human consciousness have been completely nullified,” Logdon notes. How this malady has developed so easily down under in Australia is obvious. Our exam-based culture was ripe for manipulation. Learning is regarded as a passive undertaking. It’s what someone else does to you, not what you can do for yourself. We were bred to believe that attendance at school was for passing exams, so we will teach you how to do this. We Aussies have seldom ever, except for the fifties to eighties period, diverted from this cultural hangover of believing that fear based testing is THE dominate mode of teaching because, they think, the stress factorworks. Just as the Gordon Gekkos of this world screamed “Greed is Good!’, so our masters screamed, “Stress is good!” When evidence is presented that learnacy is far more effective than such kleinist practices, the connectors between the receipt of information and the brain close down. Never before, in my lifetime have I heard some many young families openly state that they are thinking of not sending their children to school at all. And, despite my tendency to be a state primary school protagonist, I now find myself agreeing with them. Never before, in Australian history, have children been denied the right to learn without fear to the maximum in happy, stress-free circumstances at school, even though we have a work-force that can educate children in the true meaning of the word. They aren’t allowed. We have quality teachers who are absolutely controlled by sufferers of the Minnesota Malady. The kind of learning that produces giant thinkers no longer exists. Unschooling and Home Schooling – there is a difference – will be the saviours of many. NAPLAN, at present costing over over $50million per year, soon to rise to billions was, deliberately, it would seem, not mentioned by any political or media commentators during the recent budget debate. Its uselessness could have been provided as a budget savings. Don’t you find that strange? Is someone manipulating things? Surely folk who have all their receptors well wired to their brain can see this as shameful. Serious indicators, such as those revealed by Cobbold, that NAPLAN testing has failed to produce any positive results for children’s learning, have been ignored. No professional association, no politician anywhere, no part of the media empire had anything to say about such revelations. NAPLAN has seriously damaged the desire for teachers to teach creatively. It’s fast becoming just a job. Follow directions. Now that testucation replaces education, there is little need for teacher education that promotes quality teaching. It must be noted that Mr. Pyne sees teacher education as a way of ensuring that his views of instruction are carried out, having already arranged for millions of dollars to be given for some schools to adopt Direct Instruction. NAPLAN is in total control of the curriculum for far too many months each year. Nobody seems to have noticed. The use of NAPLAN in its present style is a form of child abuse. Comments exposing the deleterious effects of NAPLAN by notable world educators have been shamefully ignored by the press, politicians and testucators, so much so that it is highly likely that ACARA has already ordered or are ready to order without open discussion, the supply of millions of tabloids at a cost of billions of dollars, to perform the tests quicker and to practice for tests easier, before taking stock of whether the program is actually working now or ever will. Should true believers in kids, capitulate? The forces of evil are big and powerful, control nations and have conditioned a wide group of supporters of procrustian data-miners. Bill Shorten promised to bring Digital Language Teaching as a subject into a curriculum that is already overwhelmed by NAPLAN and should have to take its place in the queue of endless lobbies that are presently lined up for a piece of school time. Worthy proposal….but… Here’s Minnesota Malady in action. No connection. No discussion with teachers. Something will have to go from the curriculum to make room. What would you suggest? Maths, Social Studies, ESL, Reading, NAPLAN? One doesn’t have to be very bright to understand that it makes common sense to discuss this issue with classroom teachers. If the idea is sound, something has to go. They are the experts. The curriculum is far too over-packed now. Didn’t you know this? Disconnected? Wasteful, useless, damaging NAPLAN, the greatest of all disruptors must be discussed in any case in relations to its control of curriculum matters. The silence surrounding NAPLAN week, 2015 indicates a level of control from a particular source that has extraordinary power; and further indicates that the good guys, parents and the true believers have no chance, now that the machine age is on order. The big boys have won. No need for open debate. The installation of tabloids so that the tests can be done with greater speed means the completion of the publishers’ jihad. Murdoch, Pearson and Klein are rubbing their hands warmly together and exchanging big fives. Mission complete. While the cost to Australia is a few billion dollars, Mr. M. has said that it is worth $500billion per year in the U.S. alone to him. 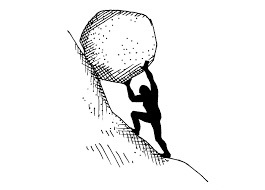 That’s big bickies and highlights the fact that the attempts committed educators to rewire the Minnesota Malady sufferers makes the Sisyphus task look like apiece of cake. If professional organisations such as principals’ groups do not suffer from the Minnesota Malady, they suffer from Eichmannism. As guardians of Australia’s teaching professionalism they seem to be immune to anecdotal and serious research…..and just don’t care. Kids have no advocates anywhere, anymore. Read The Shrinking of Treehorn again. The Underachieving School by John Holt is also worthy of an hour of your time. Footnote : A clear demonstration of the existence of The Minnesota Malady, is this. Any teacher, worth knowing, is familiar with various tried and tested rules and laws of sociology whose undeniability is as sound as any of the laws of any of the physical sciences. Campbell’s Law, Goodhart’s Law, the Lucas Technique and McNamara’s Fallacy can be applied to social circumstancs with much more reliability than any Testucator’s theories such as the NAPLAN OBSERVANCE which states:-. Testucators’ views of classroom behaviour including learning and diagnosis can be recorded on the back of an old postage stamp in bold type and large font [Hefferan]. These days we are bombarded with the phrase ‘knowledge economy.’ This article deconstructs that. This article is applicable all over. More from Sir Ken’s latest book. Bruce’s comment: So much for top down school change! After all the money and compliance requirement one third of schools showed no change (on standardised tests I presume) and one third got worse. Bruce’s comment: An excellent run through of the elements that contribute to a positive learning culture. How does your school/class stack up? Bruce’s comment: More on the theme of real learning from Guy Claxton. Both teachers and students need, according to Guy Claxton, to know what habits of mind ( learning muscles) that they need to exercise, stretch and strengthen. These ‘learning power’ capacities need to be part of all learning. They must be a permeate of the culture of the school. ‘Messages’ that learning power is important ought to be obvious to all. This article has ramifications for children during school hours. Another rebuttal of the learning styles myth. This article isn’t as depressing as the title might suggest; however it does flag issues that need to be considered. “If you take personalized learning to its logical positive extreme, technology will educate every student as efficiently as possible. This individual-centric agenda is very much rooted in American neoliberalism. Bruce’s comment: It would seem that in the US state and federal politicians introduce all sorts of standardised assessment tests and core standards which have a range of both intended and unintended consequences – narrowing the curriculum, teaching to the tests and, putting it plainly, cheating. With this mind it was refreshing to come across the below blog written by an educationalist Jay McTighe encouraging performance tasks and, even more so to read, a number of excellent practical examples. Bruce’s comment: For those involved in technology in the classroom – 5 great educational resources to consider. Principals suffering from HAS Syndrome? Are you a risk taker? Either you are or you aren’t. It seems who dares wins. What might this mean for schools?